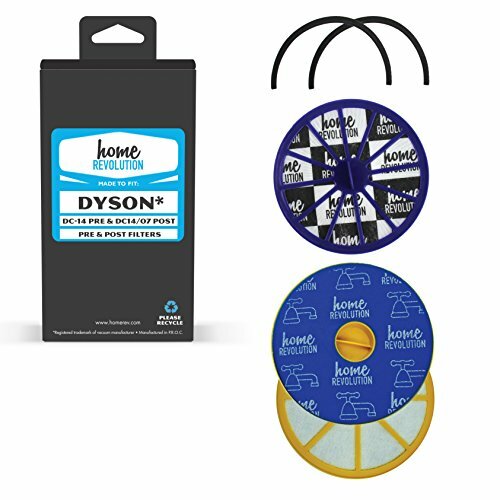 Home Revolution Brand products provide High-Quality Post Motor HEPA Filters & Washable Pre Filters for your Dyson Upright Vacuum Models. Made to Fit the following models: Dyson Dyson DC14 Upright Vacuum Cleaner Models. Compare to Dyson DC14 pre filter parts 919563-01 and 919563-02, part 901420-02 post motor HEPA filter & 10-2314-04 seals. EXPERT TIP: Energy Star recommends changing your filter a minimum of every three months, with the ideal being every month-especially in the wintertime.